Philippe Coutinho, the Barcelona midfielder, traded numbers before the 2018-19 season. 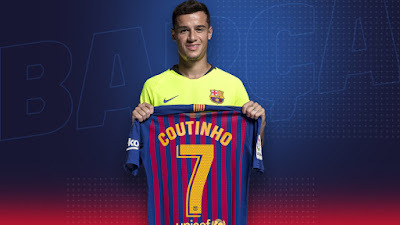 Coutinho, who was number 14 after breaking his Liverpool record in January, will be number 7, the Catalan club confirmed on Thursday. The Brazilian international became the ninth player to win in 1995, the first since Arda Turan donned the jersey before leaving the club last season. The others to wear jersey n ° 7 were Pedro Rodriguez (2013-2015), David Villa (2010-2013), Eidur Gudjohnsen (2006-2010), Henrik Larsson (2004-2006), Javier Saviola (2001-2004), Alfonso Perez (2000-2001) and former world player of the year Luis Figo (1995-2000). The No. 14 was made famous by the legendary Barcelona player and coach Johan Cruyff. Coutinho, 26, has scored 10 goals and six assists in 22 games, helping the club win championship titles and Copa del Rey in their first half-season at Camp Nou.